Jennifer Smith (P.Eng.) is the executive vice president, Global Market Solutions at Christie Digital Systems, and an alumna of Laurier’s Lazaridis Executive Master’s in Technology Management (Lazaridis EMTM) program. In 2016, Jennifer won the AV Technologist of the Year Award for outstanding achievement in the development of a new technology, solution or application. 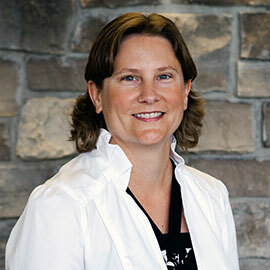 She also recently spoke at Communitech’s panel, Startup Grail: Building the $100 Million Company. The Lazaridis EMTM, an 11-month MSc in Management program for up-and-coming executives, will be accepting its next cohort in September. The program recently caught up with Jennifer to pose three questions on achieving personal and company growth in the technology sector. Q: What do you think it takes to achieve success? A: Achieving success in the commercialization of technology-based products and services, whether in a B2B or B2C environment, is an extreme challenge. Moving through the phases of ideation to proof of concept, to minimum viable product, to market launch and ultimately, to progressing along the well-known Geoffrey Moore technology adoption lifecycle curve, takes passion, persistence, resilience and discipline. In my experience, passion is the easiest to find; persistence is typically fuelled by the passion and resilience is developed by the numerous attempts that don’t go well amongst the successful few. Q: Why did you take the Lazaridis EMTM? A: Discipline is the trait that seems most difficult to cultivate and practice with patience. It’s from this discipline perspective that I sought out additional training and learning through the Lazaridis EMTM program. My engineering background had already afforded me well in the understanding of the development of technology, including a depth of knowledge about how to ideate, how to be creative, how to solve problems. But what I wanted was more awareness in how to manage technology: into the market place, within the market and throughout the entire lifecycle. Q: Why should companies invest in their talent? A: Developing this talent in our organizations is vital to the long term success of our businesses. I’ve always believed that talent is what makes great companies, and so investing in talent to enable these critical skills is essential. I often get asked about my career ‘journey’ and if it has been difficult to be a female in the technology sector. My view is that everyone needs to take ownership of their careers and to seek the experiences they want most, while pursuing the skills needed to get them there.